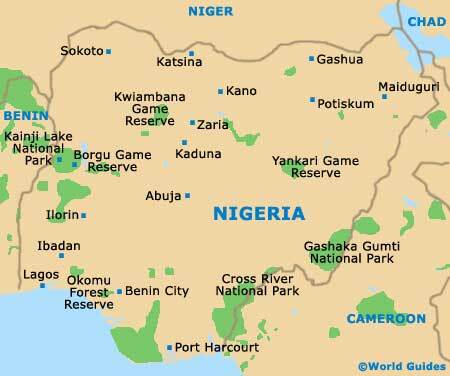 Travelling around Nigeria is relatively straightforward. In general, there's plenty of public transport in the form of buses and coaches. If you're planning to travel around Nigeria by car and aren't familiar with the roads, then it may be best to hire a driver along with the car. 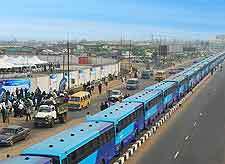 Although Lagos is no longer Nigeria's capital city, it remains its major transport hub. 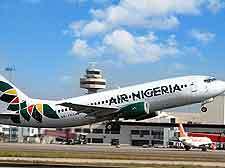 Thus, most visitors to Nigeria will arrive at Lagos Murtala Muhammed International Airport. The airport is located in the suburban district of Ikeja, some 22 km / 14 miles from Lagos city centre, and is served by all the main African airways and many international operators. To get from the airport to your hotel, car rental is a reasonable travel option, while another is to check whether your hotel can organise a pickup service. The journey by road takes anywhere between 30 and 60 minutes, depending on the weight of traffic and the time of day. Some European airlines fly to Abuja and Kano, as well as Lagos. Nnamdi Asikwe International Airport in Abuja is served by KLM, Luftansa and British Airways, as well as Delta from the US. Located around 35 km / 22 miles from Abuja city centre, visitors can get to and from the airport by taxi. Likewise, arrivals at the airport in Kano, can take a short taxi to the town centre. Domestic flights operate between most cities in Nigeria and are served by a number of local carriers. On the whole, Nigeria's roads range from good to patchy. Visitors should drive with extreme care, as Nigeria has a very high road accident rate, or better still, opt to hire a car with a dedicated driver. As a general rule, night-time driving should be avoided. Cars can be hired at the airport or can be arranged through your hotel, with petrol stations usually being easy to come by. Air conditioning is a must, because of the extreme heat. Road blocks are a frequent occurrence, but shouldn't pose a problem if your documentation is in order and you are patient with the necessary procedures. Book your Nigeria Car Rental here. Buses and coaches are useful if you are planning to travel between cities and major towns. 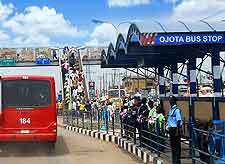 Services are operated by the Edo Line, the Edegbe Line and the Izuchkwu Line. 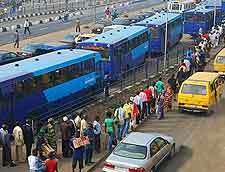 For getting around and hopping between smaller towns, minibus transport has become an essential part of life in Nigeria. Look out for signs on minibuses which show where they are going. There are no set timetables, it's more a case of getting on and waiting for the minibus to fill up. 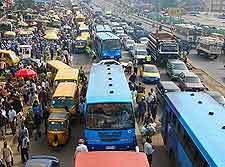 Be sure to allow extra time for heavy traffic delays in major cities such as Abuja, Benin, Ibadan, Kaduna, Kano, Lagos, Maiduguri, Port Harcourt and Zaria, amongst others. Passenger rail services are few and far between in this country and are not seen as a safe or reliable option for foreign visitors. The two main rail routes that do operate run from Lagos to Kano and between Port Harcourt and Maiduguri. Bush taxis are more expensive than minibuses, but do have the advantage of getting to your destination a little quicker. Most Nigerian towns come with one or more motorparks (often a little on the chaotic side), serving as the principal transport hub and being filled with a mixture of bush taxis and minibuses. For short journeys, motorcycle taxis known as 'achabas' or 'okadas' are a popular alternative. Lagos, Port Harcourt and Calabar are all major ports. A limited number of ferry services operate on the southern coastline and may be useful, while some river ferry services are also available along both the River Niger and the River Benue.